No town can exist without work for its people and it was indeed fortunate that Nelsons Bros new Tomoana freezing works started production at that time. Three years before, a small boiling down works owned by Nelson Bros and J.N. 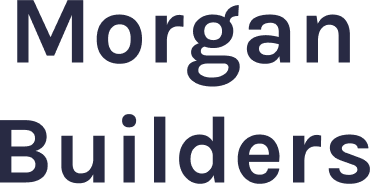 Williams had commenced operations on this site, but this was a new and much larger public company which set up this first meat freezing company in the North Island. William Nelson has often been spoken of, as the father of Hastings. Well, he certainly furnished the pay packets for the people and over the 100 years, many a man saved his money from working at “the Works” to gain his personal start in fruitgrowing, dairying or some other avenue of individual employment. W. Nelson’s career is worth recording as, like Henry Ford, he had two failures before he won through to success, twenty years after his first arrival in this country. He left England in 1862 to arrive at Auckland, a young man of 20 years of age and decided to tramp through the country before settling down and spent the next six months in Auckland, Hawkes Bay, Wellington, Nelson and Canterbury provinces, before he decided to settle in Hawkes Bay as his future home. First he purchased a small property at Kereru, in partnership with his older brother Fred, but this proved too small and they took over a sheep station near Waipukurau. Sheep stocks were building up, but there was a ready market for surplus stock to the gold miners and prospectors and sheep were driven from here to Waihi and the thames [Thames] district and also shipped to the West coast of the South Island to satisy [satisfy] their meat demands. 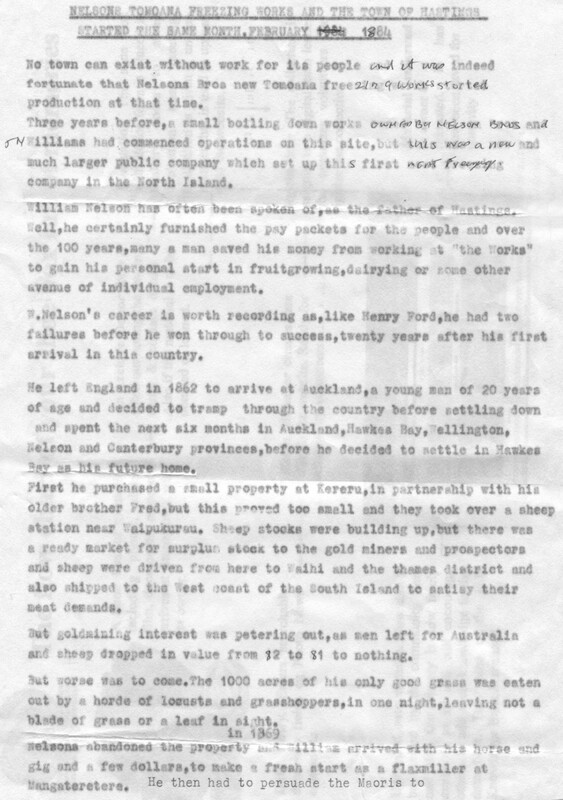 But goldmining interest was petering out, as men left for Australia and sheep dropped in value from $2 to $1 to nothing. But worse was to come. The 1000 acres of his only good grass was eaten out by a horde of locusts and grasshoppers, in one night, leaving not a blade of grass or a leaf in sight. work in his factory and cut the flax, which grew in profusion in the swamp which is now the land of Hastings. The hand treated flax, which the Maoris made into ropes and mats was an excellent export product but the machine dressed material was a very inferior sample and flax ceased to be in demand and his factory closed its doors in 1872 and he was lucky to retain the few original dollars he put into the venture. There was no immediate future for him here, so he returned to England to work with his other brother Sir Montague Nelson in the family business Nelson, Dale and Co. a meat by products firm, making meat extract soups and gelatine, made from stewing skins. He could not settle in England and his heart was in Hawkes Bay, so with the wide experience he had gained in meat byproducts and factory managem[ent] he returned here in 1880, to set up a small boiling down works at Tomoana in partnership with his brother in law, Mr J.N. Williams, of Frimley, calling the form [firm] Nelson Bros and Williams. Several other boiling down works were in operation but rather crude affairs. 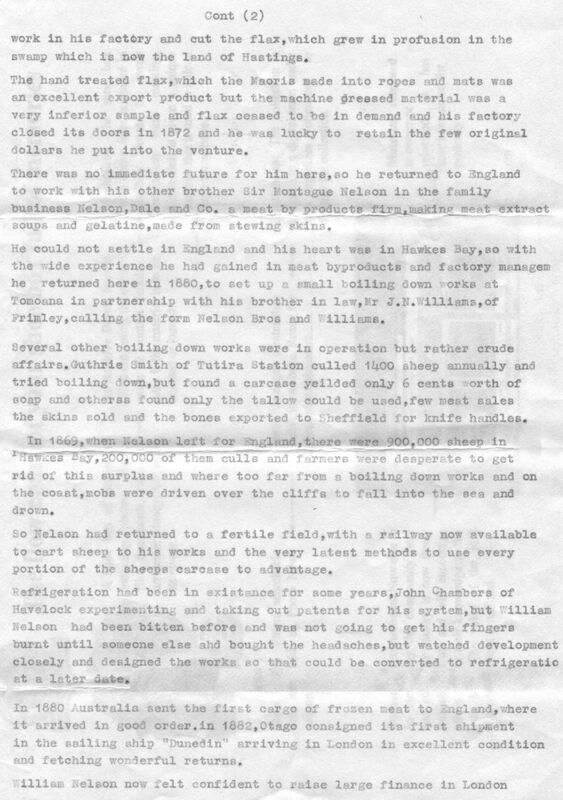 Guthrie Smith of Tutira Station culled 1400 sheep annually and tried boiling down, but found a carcase yeilded [yielded] only 6 cents worth of soap and others found only the tallow could be used, few meat sales the skins sold and the bones exported to Sheffield for knife handles. In 1869, when Nelson left for England, there were 900,000 sheep in Hawkes Bay, 200,000 of them culls and farmers were desperate to get rid of this surplus and where too far from a boiling down works and on the coast, mobs were driven over the cliffs to fall into the sea and drown. So Nelson had returned to a fertile field, with a railway now available to cart sheep to his works and the very latest methods to use every portion of the sheeps carcase to advantage. Refrigeration had been in existance [existence] for some years, John Chambers of Havelock experimenting and taking out patents for his system, but William Nelson had been bitten before and was not going to get his fingers burnt until someone else had bought the headaches, but watched development closely and designed the works so that [they] could be converted to refrigeration at a later date. In 1880 Australia sent the first cargo of frozen meat to England, where it arrived in good order. In 1882, Otago consigned its first shipment in the sailing ship “Dunedin” arriving in London in excellent condition and fetching wonderful returns. to form a limited liability [company] to take over the boiling down works and construct a large freezing works under the name of the new company Nelson Bros N.Z. Ltd. Original plans were to kill 400 sheep a day, but Nelson was sure they would be able to handle 800 a day and everyone scoffed at his optimism but he soon reached and passed this target. He was busy processing his first consignment, when the founders of Hastings were having their first Town Board meeting and shipped next month 9000 carcases in the ship “Turakina”. 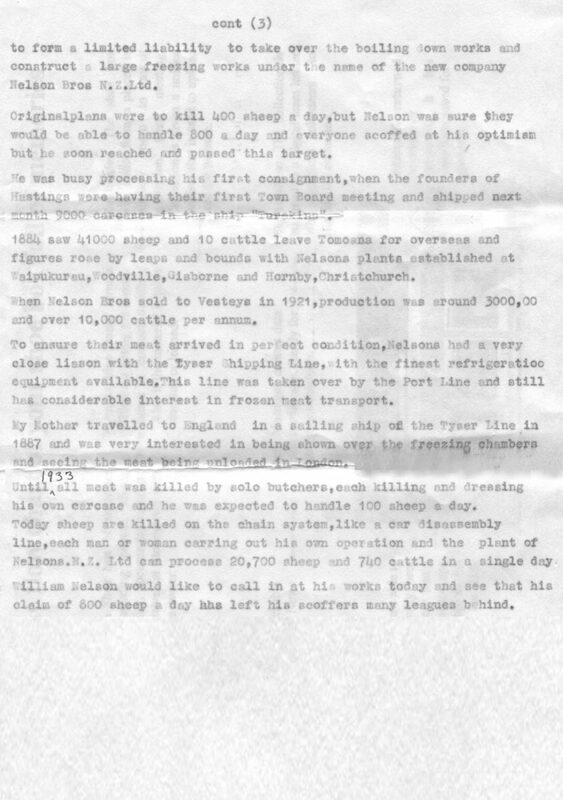 1884 saw 41,000 sheep and 10 cattle leave Tomoana for overseas and figures rose by leaps and bounds with Nelsons plants established at Waipukurau, Woodville, Gisborne and Hornby, Christchurch. and over 10,000 cattle per annum. To ensure their meat arrived in perfect condition, Nelsons had a very close liason [liaison] with Tyser Shipping Line, with the finest refrigeration equipment available. This line was taken over by the Port Line and still has considerable interest in frozen meat transport. My Mother travelled to England in a sailing ship of the Tyser Line in 1887 and was very interested in being shown over the freezing chambers and seeing the meat being unloaded in London. Until 1933 all meat was killed by solo butchers, each killing and dressing his own carcase and he was expected to handle 100 sheep a day. Today sheep are killed on the chain system, like a car disassembly line, each man or woman carring [carrying] out his own operation and the plant of Nelsons. N.Z. Ltd can process 20,700 sheep and 740 cattle in a single day. William Nelson would like to call in at his works today and see that his claim of 800 sheep a day has left his scoffers many leagues behind.